We’d love your help. Let us know what’s wrong with this preview of Traction by Gabriel Weinberg. Why do so many startups fail? According to entrepreneurs Gabriel Weinberg and Justin Mares, most failed startups make the fatal mistake of putting all their effort into perfecting their product at the cost of reaching out to potential users. Instead, they should be putting half their resources into getting traction. Traction is the essential guide for any startup looking to Why do so many startups fail? According to entrepreneurs Gabriel Weinberg and Justin Mares, most failed startups make the fatal mistake of putting all their effort into perfecting their product at the cost of reaching out to potential users. To ask other readers questions about Traction, please sign up. Will the growth hacking marketing on this apply only on social business (there are already lots digital marketing agencies out there to do these stuffs), or does it apply for a physical tech product? Red Definitely. Products as well. Traction whether digital or physical has a lot to do with connections and this book is about that. can this book help you gain costumers in construction? Red You can apply the tips in B2B and B2C contexts, so indirectly, yes. Traction. Ah, just the sound of the word alone makes my spine tingle. Traction, it seems, can forgive all sins. With enough of it, investors will commit even if you haven’t figured out your team or how you will make money. So why is it that so many founders sit on their hands and just hope that their product takes off? Ignorance. Most founders don’t know how to get traction for their startups and so they blindly double down on building a great product. They don’t know what investors mean when ask Traction. Ah, just the sound of the word alone makes my spine tingle. Traction, it seems, can forgive all sins. With enough of it, investors will commit even if you haven’t figured out your team or how you will make money. So why is it that so many founders sit on their hands and just hope that their product takes off? Ignorance. Most founders don’t know how to get traction for their startups and so they blindly double down on building a great product. They don’t know what investors mean when asked for a “Go-to-Market” plan so they skip that slide. Ignorance for how to build traction is not an excuse, and Justin and Gabriel have created a definitive guide to stepping you through the 19 channels that every entrepreneur has access to today. I don’t care if you are a food cart or the next Instagram, you will learn valuable techniques for building your business if you buy this book. This framework will guide you to quickly figure out which 1 of the 19 channels you should focus on first. It will also help you shift gears when that one no longer serves you any more. The worst thing you can do with traction is forget to shift into 5th gear while merging onto the freeway. It is about time that someone create this definitive guide. One of my favorite parts of it is that whether they are talking about radio ads and billboards or search engine marketing and Facebook ads, they give you ballpark estimates for what everything costs. If you have never put up a billboard before (P.S. I have) you might not know that you can space on one for about $8,000. Gabriel Weinberg doubled DuckDuckGo’s (the search engine) traffic with a well placed billboard. My second favorite thing about this book is that there is a fantastic example of a real pitch email for press used to get coverage from TechCrunch. When I was starting AppFog, the whole idea of pitching press seemed completely foreign to me and seeing an example like this would have helped me immensely with my public relations strategy. My only criticism of the book is that they defer heavily to lean methodologies for you to determine the content of the message you are trying to convey within these distribution channels (whether it be blogs or social media, etc). I understand that they won’t be able to put as much detail into content direction as the Lean Startup does, but I would have liked them to spend a little more time explaining how to put out the best quality content on these channels in order to get the best ROI for your traction efforts. They cover A/B testing, but spending more time on how to use empathy to write highly effective copy would have been ideal. Markus Thank you for the tremendous important information. Misha Kaura It seems like PR is actually the only differentiator. اگه علاقه مند به راه انداختن کسب و کار هستید به نظرم این کتاب خوندش واجبه. انی که تاحالا ترجمه نشده یکم عجیبه برام. تک تک برگه هاش میتونن دلار بشن برن تو حسابتون. If you're looking a book with concrete traction tactics, this is the bible. Most books will give you some loose "advice" but this goes into granular detail in a way that's easy to understand for beginners but still super valuable to people who've been in the game for awhile. Awesome job Gabriel and Justin! تمام تکنیک ها و کارهایی که میشه برای جذب کاربر انجام داد، تو این کتاب یک جا جمع و ارائه شده لطفا قبل از خواندن این کتاب استارتاپ تون رو لانچ نکنید. همین. Evernote, Yelp, Zynga, Twitter, Youtube, etc. Traction opens with a framework called Bullseye. The idea behind Bullseye is to test a number of growth channels, and quickly figure out which can help your business move the needle. To that end, the authors provide an in-depth look at 19 different growth channels, aided by interviews with people who have successfully used those channels to get traction. It's a simple book and quick read, but I've already found it very helpful in thinking about strategic growth and critical paths. As a startup founder coming mainly from the technology side, I needed a good practical hands-on guide to go beyond the overwhelming number of generic sales and marketing books. The value in this book is that while we know the general principles of sales & marketing it’s great to have a resource that provides scope, structure and a methodology for identifying and testing the most impactful traction channels for a company – particularly a new start. I used the methodology internally within my company and even with seasoned Sales and Marketing professionals, it brought out really valuable and insightful targets and approaches. It also states that when you saturate a traction channel move to another and get the edge on competitors – great advice that’s often really difficult to act on. Similar to the Innovators Dilemma. Very practical book for a fresh look at your go-to-market strategies & tactics. Good examples, to-the-point material. Really glad I stumbled upon it, gave me a lot of ideas how to improve my own business. Full of buzz words, annoyingly monotonous and only mildly useful. In my opinion, the only two valuable things I in this book are the list of 'traction' channels, and a few good suggestions for some of them, which I'll attached below. Nevertheless, it is not a long or difficult and I believe it is worthwhile investing the time to read it. The author suggests aiming to dedicate 50% of resources to product and 50% to distribution (or what he calls traction). 01. Full of buzz words, annoyingly monotonous and only mildly useful. In my opinion, the only two valuable things I in this book are the list of 'traction' channels, and a few good suggestions for some of them, which I'll attached below. Large blogs scan smaller ones for content ideas. It is then easier to target the small blogs that get read by larger outlets. MixRank and AdBeat could provide insight about the advertising strategies of competitors. One suggested strategy is to post and promote content during events the targeted audience is likely to care about. Reddit is also suggested as a way to target specific communities. The author suggests the best way to approach sales is talking to prospective customers about their setup and problems - this doesn’t only yield valuable information about the industry which could help shape a better product, but it also puts you in a good position to talk about the benefits of your solution / product. - What is the process for buying from providers for this company? - How badly do they need our solution? - Who has the authority to make the purchase happen? - Can they afford the solution and how much are they loosing by not using the solution? - Timing questions, such as what are the budgeting timelines that will influence the purchase. Great book for start-up founders and early staged employees trying to figure out how to go to market with a certain product / business. The authors provide a great method for how to figure out the best sales & marketing (or 'traction') channels for your business ('Bullseye Method'). The Bullseye Method consists of effectively running tests on the 19 different traction channels available to businesses to find the best ONE for you. The authors then lay out the nineteen different traction chann Great book for start-up founders and early staged employees trying to figure out how to go to market with a certain product / business. The authors provide a great method for how to figure out the best sales & marketing (or 'traction') channels for your business ('Bullseye Method'). The Bullseye Method consists of effectively running tests on the 19 different traction channels available to businesses to find the best ONE for you. The authors then lay out the nineteen different traction channels available to products / businesses. This is a very comprehensive list, with channels ranging from targeting niche blogs to unconventional PR (e.g. stunts) to offline ads (e.g. billboards) to social media digital advertising. I found this framework a great way to think through all of the different ways you can reach your potential customers. I also found the comprehensive list and overview of traction channels helpful in thinking through any channels we may not have tested yet. This was a ridiculous waste of my reading time. It's a collection of tips which are largely irrelevant to the target audience. I don't understand its other good reviews. To me, if you're at the point where the information here is applicable to you, you don't need this book; if you're starting out, it's not applicable. Hmm...so maybe its target audience is people working in start-ups which are beginning to see moderate success. That makes sense. Still, a lot of the advice is "just do A/B/ Useless. This was a ridiculous waste of my reading time. It's a collection of tips which are largely irrelevant to the target audience. I don't understand its other good reviews. To me, if you're at the point where the information here is applicable to you, you don't need this book; if you're starting out, it's not applicable. Hmm...so maybe its target audience is people working in start-ups which are beginning to see moderate success. That makes sense. Still, a lot of the advice is "just do A/B/C," as if anyone in the operation is a marketing/coding/managerial expert. The best marketing book I've ever read. Concise, easy to follow and to the point. I highly recommend Traction to any entrepreneur or marketer. This book will help you define your marketing strategy and improve it over time until you get to a stage where you start to notice your traction. The main point it revolves around is taking actions that make your needle move. Meaning, as long as your marketing strategy moves your business forward, you're on the right track. Through constant testing and im The best marketing book I've ever read. Concise, easy to follow and to the point. 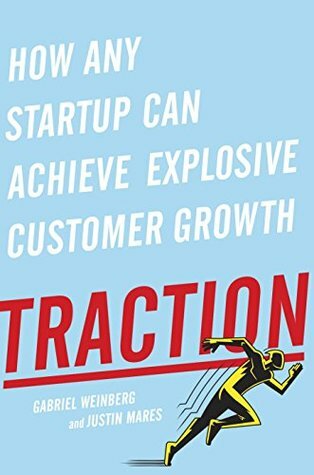 I highly recommend Traction to any entrepreneur or marketer. This book will help you define your marketing strategy and improve it over time until you get to a stage where you start to notice your traction. The main point it revolves around is taking actions that make your needle move. Meaning, as long as your marketing strategy moves your business forward, you're on the right track. Through constant testing and improving, you'll get to a point where what used to work no longer does, so you'll need to adapt your activities to your growth. And the authors nicely outline 18 traction strategies in this book, with a bullseye framework for leading you through the process. This book is a must read for everyone working in a Start Up. Weinberg dissects 19 different traction channels, summing up key terminology, tools and tactics, case studies from the real world. He also outlines a simple methodology to test and implement them. Every page is packed with actionable advice. A compresensive marketing crash course that will help everyone identify which strategy is best for th This book is a must read for everyone working in a Start Up. Weinberg dissects 19 different traction channels, summing up key terminology, tools and tactics, case studies from the real world. He also outlines a simple methodology to test and implement them. Every page is packed with actionable advice. A compresensive marketing crash course that will help everyone identify which strategy is best for the current stage of their project. Maybe if you're really up to date with the latest marketing and user growth effort, you won't be needing this book. Otherwise, it's a gem! It explained the possible ways for startups to gain traction, explaining that there are no "one strategy for all" and it even depends on what's your traction goal and your own stage. I could see myself coming back to this book over in the next months and years as I'm going through my own stages. Totally recommended for my fellow founders!! The four stars are for the first 5 chapters. The rest of the book can easily be skimmed, but there are some really good ideas and things to try in those first few chapters. I like the Bullseye framework, and I like how well it all fits into Lean methodology without too much wiggling and squeezing. If you're able to hold your nose and read past words like "utilize" and "move the needle", I'd say the first 40 pages is well worth your time. This book is a must read if you want to deeply understand marketing, growth hacking and traction strategies in the new digital age. The first five chapters are a great work on how to implement a lean and experimentation system to test and learn the best traction tactics to implement. The other chapters are the meat of the book. Each is about a specific traction tactic and how to implement it. Read it to learn how to grow your startups, app or business! Thefindsite.com roadmap to obtaining traction! As an experienced entrepreneur, Mr Weinberg focuses in on the essential element for any business,not just startups...ready, willing , and able consumers. Until you have these people you don't actually have a business. Therefore this book provides critical insight into achieving customer growth. Easy to understand and execute, this book will be read by future Mark Zuckerbergs! This is a great intro to the landscape of digital marketing, channel by channel. I thought there were a lot of interesting things in it, but I was also exhausted by the sheer number of things to think about by about halfway through. I'm glad to not be an early-stage marketer at a startup. The library loan ran out so I haven't finished it, although I might someday. A great compilation of various ways for startups to utilize marketing channels to churn out growth. Some were better than others, and some I knew while others I didn't. Overall it was great feeling ether being refreshed or enlightened on these different pathways, and the book is a good jumping point for marketers looking to gain traction for their businesses. A list of very actionable tactics for getting traction. The book won’t teach you unique tactics but rather show popular ways that other startups had used before. Nevertheless, I think it’s a good starting point for most businesses. Great practical advice on how to test and decide on which growth channels to focus on in a particular stage of your business. The book is concise and the examples it provides can trigger your imagination. traction is all about early growth for startups. the book is a good compilation of techniques and ideas, but nothing spectacular if you have followed the developments in digital marketing in recent years. I'd recommend this to founders who have no idea about digital marketing. I really liked the way this book is structured. It is super concise and full of examples. I had no idea there are so many channels and it really sparked a few ideas while reading it. A good book for growth hackers. Lots of practical tips. One of the most useful and actionable books I have read in a long time. A great read for anyone working (or aspiring to one day work) within an ambitious startup. Gabriel Weinberg is the Founder & CEO of DuckDuckGo, the search engine that doesn't track you with over a billion searches in 2013. He is also an angel investor and co-author of Traction: A Startup Guide to Getting Customers. Weinberg has been featured on CBS, FOX, the Guardian, the Washington Post and many more. Previously he was the Co-founder & CEO of Opobox, which was sold to United Onl Gabriel Weinberg is the Founder & CEO of DuckDuckGo, the search engine that doesn't track you with over a billion searches in 2013. He is also an angel investor and co-author of Traction: A Startup Guide to Getting Customers. Weinberg has been featured on CBS, FOX, the Guardian, the Washington Post and many more.